Is it strep throat? This time of year, parents all over the country are asking this question as their children come home from school with fevers and sore throats. While strep throat is common, only a small portion of sore throats are the result of strep throat. And while strep throat is especially common in school-aged children, it can affect men, women, and children of all ages. Are You Wondering What to Do If You Have a Fever and Sore Throat? The common cold, strep throat, and tonsillitis are all illnesses characterized by a fever and sore throat. Read on to see how they compare. Do you have a cough? Coughing is a common symptom of a cold but is rarely found in cases of strep throat. Do you have a fever? Strep throats are typically accompanied by a high fever; meanwhile, colds produce a low-grade fever or no fever at all. Sore Throat, Strep Throat or Tonsillitis? 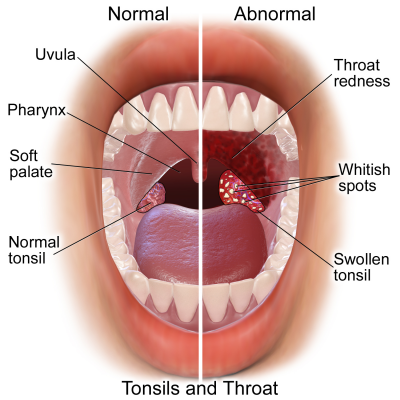 Strep throat is actually a form of tonsillitis, caused by a bacteria and often referred to as bacterial tonsillitis and treated with antibiotics. However, most cases of tonsillitis are viral and won’t respond to antibiotics. See sore throat image above. A sore in your throat generally lasts only a day or two. If you’ve got a runny nose, or you’re experiencing congestion – these symptoms commonly accompany a sore throat. If a sore throat lasts longer than a day or two and the pain is severe, you may have tonsillitis. Since symptoms of bacterial (strep) and viral tonsillitis are so similar, a physician can perform some quick tests to determine the course of treatment. While the illnesses listed above are commonly associated with fevers and sore throats, they are not the only illnesses you could be suffering from. Seeing a medical professional is the best way to diagnose an illness and ensure a fast recovery. Arming yourself with a basic knowledge of these symptoms will help you decide what to do if you have a fever and/or sore in your throat. FastMed Urgent Care can perform rapid strep throat tests within minutes to determine if your fever and sore throat are results of strep throat. FastMed Urgent Care offers strep throat tests and treatment. Need medical care in a hurry? Check-in now with FastMed’s ZipPass!